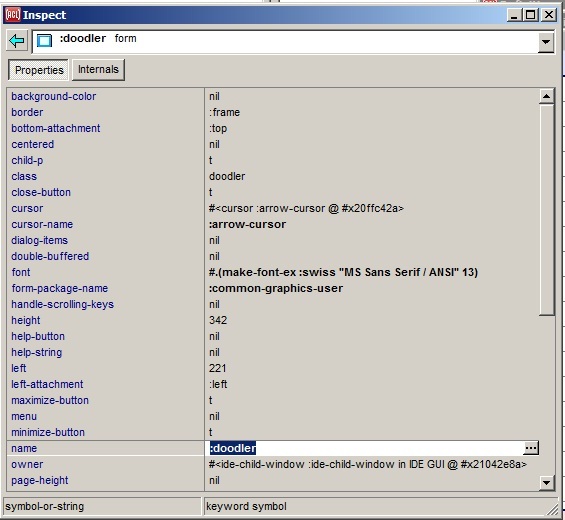 The Inspector window displays information about objects. The same information is displayed (when not in the IDE) using the function inspect and the various inspector top-level commands documented in the inspector.htm. This dialog is displayed by the various Inspect commands on the Tools menu, such as Tools | Inspect Selected Object. It is also displayed (even when the IDE is not running but is loaded) by the operators ide:ide-inspect and ide:ide-inspect-standalone. The illustration shows an Inspector window inspecting a form. We describe the various fields and controls on the Inspector, and the right button menu. The buttons at the top (in the illustration, Properties and Internals, other objects may have more or different buttons), indicate what pane of the window is visible. In the illustration, the Properties pane is visible and the button looks pressed. Properties are usually changeable aspects of the object while Internals should not normally be modified. Controls have an Events button listing the event functions called when certain mouse events occur over the control. The Inspector lists various component parts or other attributes of the object that is being inspected, with the name of the part appearing in the lefthand column and its value in the righthand column. The component parts of a standard object, for example, are its slots, whereas the parts of a list are the list's elements, with the indices of the elements serving as the part names. If the inspected object is a standard-object or structure-object, then the home package of each slot name symbol is also shown in the left column. Each value is printed according to the IDE options dialog-print-level, dialog-print-length, dialog-print-array, and dialog-print-circle, which can be set on the IDE 2 tab of the Options dialog. If the printed representation doesn't fit in the single-line table cell that's provided for it, you can see the full text (or much more of it) in a large tooltip window by holding the mouse cursor over the value in the righthand column. Even if the value does fit as printed, a tooltip will still appear if a longer representation will be printed by extending the printer variables *print-level*, *print-length*, and *print-array*. Specifically, the tooltip will use a *print-level* that's one greater than the IDE option dialog-print-level, a *print-length* that's triple the value of dialog-print-length, and with *print-array* always true. The necessary hovering time for the tooltip to appear is controlled by the Common Graphics option tooltip-delay, which can be set on the CG tab of the Options dialog. You can replace the value of most object parts by clicking on the value in the righthand column to select it, and then typing in a new value. This works only if the Lisp reader can return the desired type of value from the string that you type. Alternately, you can click on the small extended editor button at the right end of the selected row to show a dialog for editing the value in a more powerful way. On the Internals tab, the extended editor will always be a text-editing window where you can enter a Lisp form that will be evaluated to produce the value to use. On the Properties tab, a more specialized dialog may appear that's designed for editing the particular type of value that the property is declared to have, such as the font dialog when the property is declared to hold a font. The image on the extended editor button indicates which specialized dialog will appear. Clicking on a part name in the lefthand column will inspect the value of that part. Then clicking the left arrow button at the upper left of the inspector will return to the first object. The drop-down list at the top shows a history of the objects that have already been inspected by this inspector. The objects are arranged into a hierarchy, where objects that were inspected by clicking in the left column of the inspector are indented just below the objects from which they were inspected; otherwise more recently inspected objects appear toward the top of the list. Clicking an item in this list re-inspects it. A pixmap appears at the left of each item in the drop-down history list to make it easier to find objects of various types. By default, widgets are identified with the pixmaps that are used for them in the Component Toolbar, windows display a picture of an empty window, all other first-class objects (instances of standard-object or structure-object) display a solid gray dot, and all remaining objects show a hollow dot. These pixmaps (except for the dots) also appear in the always-visible part of the history widget for the currently inspected object, and appear in the rows of the inspector body when it is inspecting a sequence. The inspector may be customized to show additional pixmaps for other types of objects by defining pixmap methods. The button with a left-pointing arrow at the upper left of the inspector re-inspects the previously-inspected object. Clicking this button multiple times will re-inspect successively older objects from the inspector history. Or use your mouse's back button if it has one. The status bars at the bottom show the type of value accepted (on the left) and information on the value on the right. Inspect in New Window: Inspects the currently selected object, but first opening a new inspector window in which to inspect it. This allows retaining the current state of the earlier inspector. Inspect Callers: Inspects a list of the names of the functions, methods, and macros that call the currently selected function or use the selected macro, if one is selected. This command will appear on the menu only if the currently selected value is a either an fbound symbol, a list of setf and an fbound-symbol, a method spec list, a function object, or a method object. When the value specifies a method, the list that is inspected will include all of the callers of the method's generic function rather than of that particular method, because the particular methods that a function calls is determined only when arguments are passed at run time. The inspected list is obtained by calling xref:get-relation, passing :calls as the relation argument. Callers are known only when *record-xref-info* and *load-xref-info* are true when the code is compiled and loaded respectively; those variables are always true by default in the IDE. Inspect Users: Inspects a list of the names of the functions, methods, and macros that use the currently selected global variable, if one is selected. This menu command will appear on the menu only if the currently selected value is a bound symbol. The inspected list is obtained by calling xref:get-relation, passing :uses as the relation argument. Users are known only when *record-xref-info* and *load-xref-info* are true when the code is compiled and loaded respectively; those variables are always true by default in the IDE. Inspect Referencers: Inspects a vector of all of the objects in the Lisp heap that point directly to the selected value object. The inspected vector is obtained by calling excl:get-references. To avoid including objects that are no longer being used, you may want to first do a (gc t) and/or use the Clear History command on this same menu and the Clear History button in the Debug Window's toolbar and the Clear button on the Trace Dialog. Refresh Values: Updates the currently displayed information to reflect any changes that have occurred in the lisp environment since the most recent inspection was done. This essentially re-inspects the current object. Information is also updated when re-inspecting an object from the inspector history, or for an individual attribute if it is not read-only and is selected for typing in a new value. Inspect Sorted Copy: This command will appear only if the currently inspected object is a list or a vector. It inspects a new list that is created by sorting a copy of the inspected object alphanumerically by the print names of the elements of the sequence. This may facilitate finding a particular item in the sequence. Back in History: Re-inspects the previously inspected object, just as the arrow button at the upper left or your mouse's back button does. Forward in History: Re-inspects later objects just after earlier objects have been re-inspected. Or use your mouse's forward button if it has one. Clear History: Empties the inspector history of all objects that have been inspected so far. This may be needed before calling get-objects or get-references to examine the heap, so that the garbage collector can first remove this old information from the heap. This command does not trigger a garbage collection itself, though; that can be done with a call to gc. Alternately you could close the inspector window. You may also want to use the Clear History button in the listener's (Debug Window's) toolbar for the same reason. When you inspect a long list or vector, the inspector will initially display only the first fifty elements, for efficiency reasons. To display the next set of fifty elements, you simply need to scroll to the bottom of the ones that are displayed so far. You can do that either with the keyboard (using the PageDown key or the down arrow key) or with the mouse (by dragging the scrollbar or pressing its lower arrow button). GTK note: You may need to use the keyboard technique if the scrollbar method does not work. The Properties and Events tabs also provide brief documentation on how to access an object programmatically (assuming that properties are defined for the object). The function for reading the value of a property almost always has the same name as the property. would initialize the border when creating the object. A property value is displayed in a bold font if it is not equivalent to the programmatic default value for that property. This highlights values that you have changed, as well as some sample values that are given to widgets that you place onto forms (and which you typically will want to change). A read-only value will never be bold. A handful of properties are never shown bold because they generally do not have meaningful default values and are more distracting than useful when made bold; these exceptions include the properties child-p, class, tab-position, left, top, width, height, dialog-items, and pixmap-use-handle. Brief help information is supplied in the main Allegro status bar when a property is selected in the inspector, and for more detailed help (or to make sure that the accessor functions really have the same name) you can invoke the Help | Help On Selected Symbol command (shortcut F1) while the property or event handler of interest is selected in the inspector. For further information on using properties programmatically, refer to defproperties or define-property.